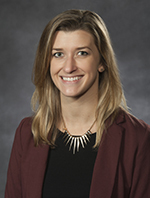 Alex Nowak joined the University Public Affairs staff as a senior public relations specialist in September 2018. Working on behalf of VCU Health, Nowak leads strategic communications and media outreach for the VCU Medical Center and its services lines, including Pauley Heart Center, Harold F. Young Neurosurgical Center, Evans-Haynes Burn Center, women&apos;s health initiatives and more. Prior to her time at VCU, Nowak worked at VOX Global - a communications and public affairs agency - in Washington, DC for five years. There, she led integrated communications campaigns in collaboration with a variety of stakeholders to solve her clients&apos; challenges and enhance their reputations. Nowak specialized in corporate social responsibility (CSR) communications strategy and her clients included Fortune 50 companies, national associations and nonprofit organizations. Nowak earned bachelor&apos;s degrees in business and communications from Virginia Tech in 2013.